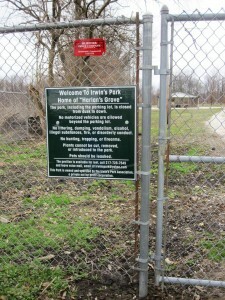 Irwin’s Park, two miles north of Auburn off Illinois 4, is probably the oldest public meeting place in Sangamon County. For many years, it was also one of the most popular. Today, the property, operated by Auburn Township and the non-profit Irwin’s Park Association, is mainly a picnic and hiking spot. In its early years, it was the site of religious and political meetings. The site was most popular, though, from the 1900s to the 1940s, when interurban trains delivered throngs of fun-seekers to Irwin’s Park for dancing and swimming. In the (mid-1820s), this class moved to the cabin of John French, located in “Cherry Grove,” a prominent stand of timber on Panther Creek renamed “Harlan’s Grove” after Methodist farmer Silas Harlan filed a claim there in 1827. Over the next quarter-century, Methodists and others held annual revivals at the “Sugar Creek Campground” in Harlan’s Grove, amid what one participant later called “forty acres of the most magnificent timber, perfectly cleared from undergrowth and brush, and presenting a deep, unbroken shade, with a carpet under your feet of the deepest green.” Harlan’s Grove became one of the most important religious and social sites along Sugar Creek. Cherry Grove/Harlan’s Grove was part of a 1,000-acre tract Silas Harlan (1782-1844) bought when he moved to Sangamon County from Kentucky in 1827. Thirteen years later, Harlan built a home a few hundred yards east of the grove. Its unusually tall stone foundation gave the building its name, the Rock House. It stood until the 21st century. Harlan’s daughter Rachel (1840-1924) married James Irwin (1833-1908), an Irish immigrant who became a railroad worker and farm laborer in the U.S. By the time he married Rachel in 1854, Irwin was a farmer in his own right; he later served in the Union Army during the Civil War, reaching the rank of captain. Rachel and James Irwin inherited part of Silas Harlan’s estate, including the grove, when Harlan died. One such enterprise, the abortive first attempt to hold the 1871 meeting of the Old Settlers of Sangamon County at Cherry/Harlan’s/Irwin’s Grove, was described in the Sept. 15, 1871, edition of the Illinois State Journal. A soaking rainstorm meant few people attended the scheduled get-together, which finally was postponed for two weeks. But Irwin saw to it that those who did reach the grove did not regret it. Capt. Irwin captured the whole party from Springfield and bore them in triumph to his castle. After a careful investigation of a dark, mysterious bottle which we believed contained “ague bitters,” the whole party … sat down to a most bountiful dinner, to which they accorded the fullest justice. Chickens, ham mutton, cakes, pies, etc., etc., fell before the combined attacks, when, after an hour spent in plying the knife and fork, the party concluded they were not hungry. If a famine arises in the neighborhood of Irwin’s Grove before long, we shall not be astonished. May Irwin live to attend the old settlers’ meeting a hundred years from now, is our honest wish. Irwin’s Grove was the site of later Old Settlers meetings as well. Following the 27th get-together in 1886 – “Irwin’s grove is deserted and nothing but watermelon rinds, wet straw and trampled grass remains to mark the spot,” the Illinois State Journal reported – the Old Settlers passed a resolution honoring James Irwin. Resolved: That we, every one – old settler and young settler, “snow-bird” and newcomers to our country – most heartily tender to Capt. James Irwin, wife and children, our most hearty thanks for all his kindness to us on this most glorious and successful occasion. The Illinois Traction company has leased the pleasure ground so long known as Irwin’s Grove, near Chatham and thirteen miles east (sic – it is south) of Springfield and now has a large force of men engaged in transforming it into a model picnic ground. The park is situated in a beautiful grove through which Panther Creek runs. A dancing pavilion, band stand for Sunday concerts, walks and rustic benches are built at the park and an effort is being made to have it open by next Sunday. The name of the new pleasure ground, which is just the proper distance from Springfield, has been changed to Irwin’s Electric park. It is a forty minute run from Springfield and the interurban people will make a very low round trip rate to parties wanting the park for picnic purposes. Perhaps 5,000 people attended the opening of Irwin’s Electric Park on Sunday, June 18, 1905, the Illinois State Journal reported. The park was formerly known as Irwin’s grove, but has been improved by the erection of a new pavilion, skating rinks, refreshment stands, picnic tables and everything necessary for an ideal outing. The creek affords ample opportunity for fishing and boating. A large number of the pleasure seekers remained at the park in the evening and listened to the Virden band which gave concerts in the afternoon and evening. The park was the site of numerous church picnics, labor union outings, holiday celebrations, band concerts and more during its early years. Aside from food, Irwin’s offered opportunities for swimming, fishing, baseball games, foot races and other activities.Swimming and boating originally were possible in Panther Creek and then a pond dug on the property. A swimming pool with diving towers and a pool house was added north of Panther Creek in 1930. The park’s most prominent feature was the dance pavilion, which could hold several hundred people on “one of the very best hard maple dance floors in central Illinois.” Orchestras like the Illinois Watch Factory Band and Professor Blood’s Band from Springfield appeared at Irwin’s, and the park soon began to host dances every Sunday night. The heyday of Irwin’s Park dancing was in the 1920s and ‘30s. State Journal-Register writer Fran Bernard wrote about dancing at the park in 1974. “That was the hot spot in those days,” Basil Tyler of Springfield told Bernard. “Every Sunday night in the summer I drove a carload from Divernon out to Irwin’s Park. Popular bands at Irwin’s over the decades included Paul Termine’s ensemble from Springfield, Chaw Mank’s Band (Mank was co-writer of the supernatural country ballad Bringing Mary Home) from Staunton, and the Tiny Hill Orchestra, a nationally known “territory band” led by the 350-pound Hill, a native of Sullivan, Ill.
James H. Irwin (son of Capt. Irwin — ed. ), the owner, is assisted by his sons, Charles, James, Carlie, Arthur and Gene, and on Sunday evening employs fourteen other people not counting the orchestra. … Park grounds are kept in splendid condition at all times, and the park is remarkably free of mosquitoes during the evenings and nights. Dance pavilion will accommodate 200 couples, and tables and chairs will accommodate 100 patrons. 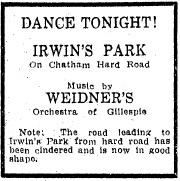 Dancing continued at the park until at least the early 1940s – a newspaper ad in June 1942 solicited a band to play for Thursday evening dances at Irwin’s – but the lack of young men because of World War II presumably brought an end to the weekly events. The Irwin family closed the park shortly after the war. 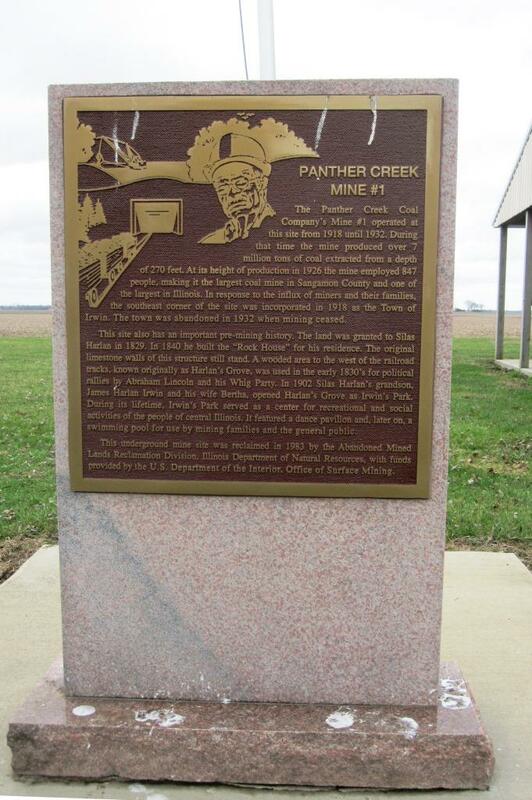 A historical marker on the site says Paul Irwin dismantled the dance hall and lunch room in 1946. However, Irwin’s Park researcher Dale Elenberger says some groups still traveled to the park for dances in the early 1950s and he believes the pavilion was demolished in about 1956. At any rate, the only remnants today are a sidewalk between the interurban stop and the pavilion and parts of the dance hall’s concrete foundation and brick restrooms. No photos of the dance pavilion are known to exist, although Elenberger has located a line drawing that can be seen in an illustrated scrapbook available through the Chatham Area Public Library. The dance hall was south of Panther Creek, a few yards from the interurban stop. The north and south sides of Irwin’s Park were connected by a bridge known as “the pony truss bridge” because of its construction style. 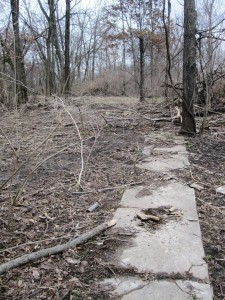 Though in bad shape, Silas Harlan’s Rock House was still standing in 2008, when Elenberger photographed it (those photos also can be seen in the Chatham library’s online scrapbook). It was demolished sometime later. 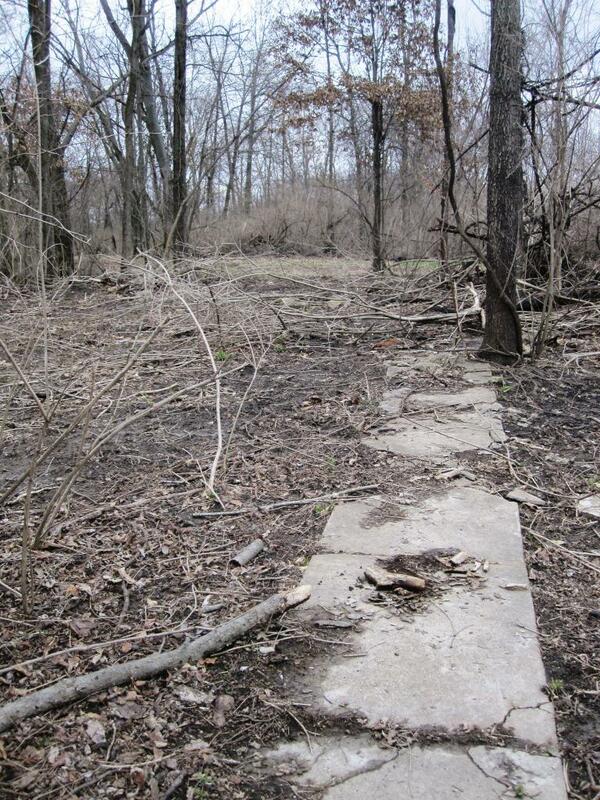 The five-foot-high foundation blocks were of yellow Sugar Creek limestone taken from the same quarry that provided the stone for the state Capitol in Springfield (now the Old Capitol State Historic Site). Panther Creek Coal Co. Mine No. 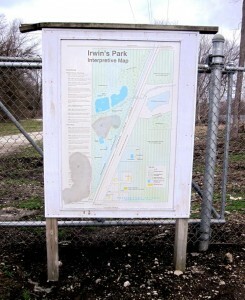 1 operated from 1918 to 1932 east of the Union Pacific Railroad line that divides the two parts of today’s Irwin’s Park. According to a plaque on the east section of the park, at the peak of production in 1926, the mine was the largest in Sangamon County, employing 847 people. Many of them lived in the small – perhaps three streets total – town of Irwin, southeast of the mine. The town of Irwin was abandoned and dissolved when the mine closed. The Irwin family donated the park property and adjacent farmland to Auburn Township in 1991, and farm revenue supports maintenance of the old park. Since 2007, the Irwin’s Park Association has refurbished the park, constructing new picnic shelters and adding historic markers. The park consists of two sections. The larger, more rustic portion, which includes the site of the former dance pavilion, is west of the Union Pacific railroad. A smaller section east of the tracks includes a plaque focusing on the old mine and town of Irwin. There is a picnic shelter on each section. To visit the park, follow Illinois 4 south of Chatham to Cherry Grove School Road and turn east. The interpretive map posted at the west-side entrance to Irwin’s Park reports that Abraham Lincoln visited Harlan’s Grove for Whig Party rallies regularly from 1832 and 1846 and that he stopped at the Rock House “many times” as a circuit-riding attorney. Lincoln also prepared legal documents for the Harlan family in 1838 and 1846, according to the map legend. Confusingly enough, a site in western Sangamon County near Pleasant Plains also was known as Irwin’s Grove and hosted picnics and similar get-togethers — including Old Settlers conclaves — in the late 19th and early 20th centuries. That Irwin’s, which was never commercially developed, was owned by the family of Samuel and A.B. Irwin. Newspaper stories of the time do not always distinguish between the two groves. In addition to the Elenberger scrapbook, ‘Lyn Pignon of Auburn compiled Irwin Park’s Memories: An Anthology (2007). It is available in the Sangamon Valley Collection at Lincoln Library and at the Chatham Area Public Library. Hat tip: To Dale Elenberger, whose research and photographs have helped preserve much of Irwin Park’s history. His March 13, 2016 presentation at the Chatham Railroad Museum was instrumental to this entry. This entry was posted in Amusements, Celebrations, Coal mines and mining, Historic Sites, Markers, Parks, Sports and recreation. Bookmark the permalink.